Tariffic says FNB Connect's new unlimited calls package is cheaper than any competing offering on the market. 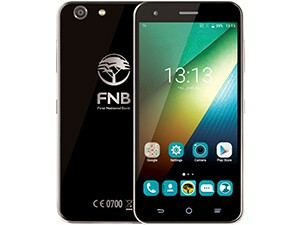 FNB Connect's new unlimited calls package is the most affordable of its kind on the market, according to cellphone spend-management company Tariffic. "When you compare FNB Connect's new unlimited voice package to the equivalent packages from all other mobile networks and MVNOs [mobile virtual network operators], you find that FNB's new offering is very well priced, coming in cheaper than any of the competing offerings," says Tariffic CEO Antony Seeff. To ensure it was comparing apples-with-apples, Tariffic factored in the cost of adding data bundles to those unlimited voice packages that come with less data so that only unlimited voice packages with 10GB of data were compared to one another. "FNB's Unlimited Voice package is R34 cheaper than me&you mobile's Unlimited Talk package and R135 cheaper than the next-best packages offered by Cell C and Telkom," says Seeff. The R399 per month package from FNB offers unlimited calling to any network, with fair usage set at 2 000 minutes per month, but only comes with 100MB of data. With extra data bundles to bring the total up to 10GB, the package will cost R864 per month. This is still cheaper than R898 for me&you mobile's equivalent package and far cheaper than the most expensive offer on the market of R2 048 from Vodacom. 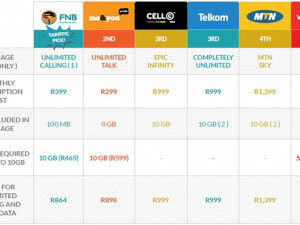 The table below shows how the unlimited calling packages from the different mobile operators and MVNOs stack up against FNB's newly launched offer. "FNB is trying to establish itself as a major mobile operator and the major mobile operators are trying to entrench themselves with their client bases and broaden their offerings," Seeff says. "Everyone wants to own the market when it comes to mobile, but this is becoming much more than just offering cellphone contracts and is expanding into other products and value-added services," he adds. Earlier this week, FNB announced it will soon start selling two FNB-branded cellphones to its customers: the ConeXis X1 and ConeXis A1. The A1 costs R59 per month for 15 minutes airtime and 50MB of data, while the X1 is R150 per month with 25 minutes and 100MB of data included. These phones will be available from FNB's banking branches from 1 September and are integrating into FNB's ecosystem, with the FNB banking app and FNB branding coming pre-installed on the phone. The phones are available to customers who have a banking transactional account with FNB but are SIM-locked and only work with FNB Connect SIM-cards. There is no credit check, but a refundable deposit is required, which is parked in a Linked Savings Account and returned with interest to the customer after 24 months. In addition, FNB customers can earn discounts on their cellular spend depending on their eBucks Rewards level.